About WigWam: This much-loved toy shop was founded in 2001 and has a loyal following among the familes of Brighton and Hove. Sadly, due to the illness and tragic death of the original owner, the shop closed in early 2013. 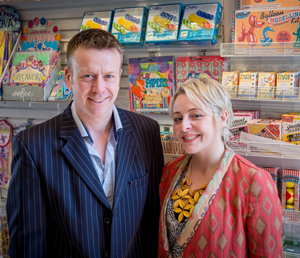 In March 2013, Clair Letton and Jesse Marshall bought WigWam and officially re-opened the shop on 20th April 2013. From then onwards, the shop will be open from 9:30am – 5:30pm Mondays-Saturdays. WigWam stocks a wide range of well-known and rather unusual toys, books, pocket-money treats, greetings cards and gift wrap for girls and boys. WigWam will soon be trading on-line as well. (Watch for future announcements). About the new owners, Clair Letton and Jesse Marshall: Clair and Jesse met in Brighton in 1998. They both hold art degrees (Clair in Fine Art Print Making, Jesse in Sculpture). They moved to Fiveways in 2006 with their son and went on to have two more children. If you have ever visited The Brighton Festival Artists’ Open Houses in Fiveways, you may remember The Cake House, the “pop-up” shop and café run by the couple and exhibiting the work of local artists (as well as serving teas and some of the prettiest cakes you will have ever seen). This blog shows just a small selection of what we sell, we have tried hard to find attractive & affordable toys that are a bit unusual, & present good value for money. We hope you like them as much as we do, & we would love to see you in the shop soon.